Descend by rope 165 feet into the huge main chamber of Moaning Caverns! No experience is necessary, and gloves, hard-hat, and the highest quality rappelling equipment are provided. Adventurous people from all walks of life are thrilled by this unique and exciting opportunity to try something new! 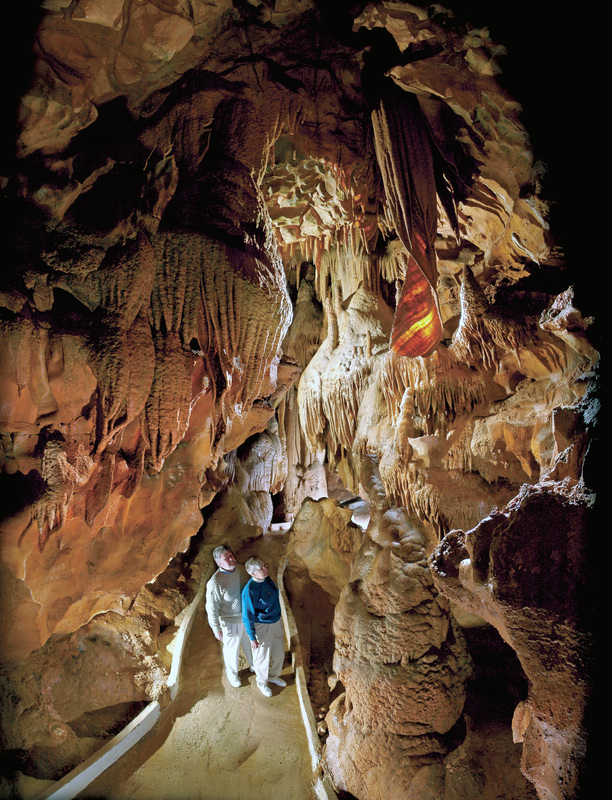 For over 153 years Diamond Caverns has offered tours of Kentucky's most beautiful cave. Presented by state-of-the-art lighting, Diamond Caverns features intricate drapery deposits lining the halls in cascades of naturally colorful calcite with thousands of stalactites, stalagmites and flowstone deposits throughout the entire tour. Most caves are solutional caves, often called limestone caves for the common type of soluble rock in which they form. The caves form as groundwater dissolves quantities of soluble rock by seeping along joints and faults. The National Caves Association, which represents 90 show caves in the United States, Bermuda and Barbados, has declared June 6 as National Day of Caves and Karst to increase awareness of the roles both play in our lives and the environment. This year, 2019, marks the third year for this special event. According to www.CavesLive.org, which is sponsored by the USDA Forest Service and Prince William Network, caves and karst make landscapes diverse, fascinating and rich in resources, including the largest springs and most productive groundwater on Earth and 175 different minerals, a few of which have only been found in caves. They provide a unique subsurface habitat for rare animals and preserve fragile archaeological and paleontological materials for millennia. There’s so much to see, learn and discover underground. With publicly accessible caves located throughout the country, the objective of National Caves and Karst Day is to encourage people to tour at least one cave during the summer. Here five reasons why they should. 1. See things they’ve never seen before. No two caves are alike. Sights on a cave tour include formations, millions of years in the making, such as stalagmites, stalactites, aragonite crystals, flowstone and cave bacon. There are also many caves with water features, such as underground rivers, pristine lakes and raging waterfalls. 2. Spend quality time with family. Some of the best family memories are made during summer vacations and staycations. Exploring caves with kids not only means quality time together, it can spark an interest in science and nature that will last a lifetime. Bonding opportunities exist as well when family members share a challenge such as going deep underground for an adventurous wild tour. 3. Cave tours are educational. Most guided tours teach guests about the history of that particular cave and the surrounding area, as well as its geology, the positive impacts of bats and the importance of cave conservation. There’s a lot more to learn about the scientific research that’s taking place in caves around the world. Universities are partnering with privately owned caves to learn how unique bacteria can play a role in cancer treatment and the development of new antibiotics. Researchers also collect broken formations to track historical weather trends dating back hundreds of thousands of years and take water samples to identify changes in mineral content. There’s no limit to the ways that we can benefit by better understanding caves and karst. Astronauts train underground, and NASA is considering the possibility of using a cave to create a shelter on Mars so that only one exterior wall has to be constructed. Cave discoveries include unique species as well as fossilized bones, some dating back to the Ice Age. The list goes on and on. The National Park Service offers a Junior Cave Scientist Program to encourage kids’ learning. A free activity booklet is available for download at https://www.nps.gov/subjects/caves/junior-cave-scientist-program.htm (link). 4. Spending time in nature has many benefits. Multiple studies show that nature boosts our mental and physical well-being. Benefits, particularly when paired with exercise, include restored mental energy, better vision in children, improved concentration, sharper thinking and creativity. Spending time in natural spaces has been linked to increased energy, improved cognition, reduced anger and stress, lower blood pressure and slower heart rates. These aren’t your grandfather’s cave tours. 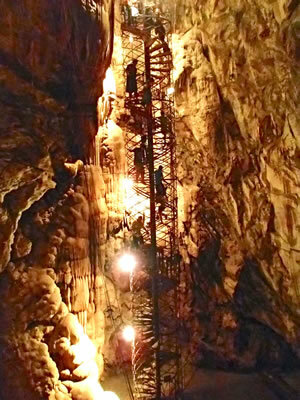 Options for exploring and spending time in caverns are increasing each year. Visitors can: travel on underground rivers in electric tour boats at Bluespring Caverns and in kayaks at Indiana Caverns, both in Indiana, or by floating at Natural Stone Bridge Caves and Park in New York; watch live concerts broadcast by PBS or camp out at Tennessee’s Cumberland Caverns; and listen to the Great Stalacpipe Organ, the world’s largest musical instrument, at Luray Caverns in Virginia. Visitors to the Sea Lion Caves wildlife preserve and bird sanctuary on the Oregon Coast often spot sea lions inside the cave, depending on the time of year. Sometimes, just getting to the cave is fun. Access to Glenwood Caverns and the Historic Fairy Caves in Colorado is via gondola, with panoramic views of the Rocky Mountains along the way. In California, guests descend 150 feet by rope to enter the main chamber at Moaning Caverns, no experience required. A Lake Shasta Caverns’ California adventure begins with a ride across the crystal blue waters of Shasta Lake on a 65-foot catamaran. Many caves of the NCA offer educational programs to students, scout troops and more! Contact our Director for a list of caverns that offer these programs.